iPhone 4 and 3GS when it comes to iOS 6 - A lot less soup for you. If you want turn by turn directions with iOS 6. Only the iPhone 4S and iPhone 2012 will support turn by turn. iPhone 4 and iPhone 3GS owners sorry no soup for you. Which again brings us back to the WTF phrase going through most peoples minds that own the 3GS or 4. Clearly the iPhone 4 and even 3GS can handle turn by turn directions - Tom Tom, Navigon and others have been offering up apps that do that for some time now and work great on the 3GS and 4. So the only real and logical reason for Apple to not include it is simply a marketing decision to get you to upgrade early. But really Apple if turn by turn was what would drive someone to upgrade - would they not have upgraded to an android phone where that feature is standard on even the most run of the mill get it free with a 2 yr contract type android phone. So Apple Shame on your for not getting Turn by Turn navigation working on the iPhone 4 and 3GS. You know you are still actually selling those devices. Just Sayin. Clearly looking at this list there are features missing from the iPhone 4 and 3GS that can only be explained by one word - MARKETING. Expect to read / hear more about this in the months to come. 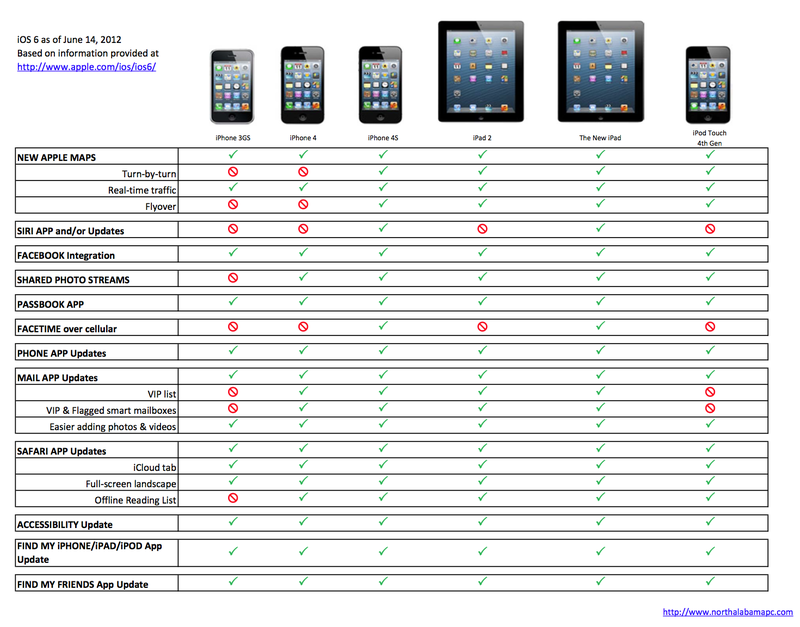 According to that chart, the iPod Touch 4th gen will get Phone app updates. Somehow I doubt that. Brad - that is exactly the issue - Not the Wet Eyes - but that you can buy one of these devices still today and some features that are available on the cheapest Android devices for years - are still missing on iPhones for sale today. It does not look good and for some of the features missing - really can only be explained by Apple wanting people to upgrade. Get over it... dry your eyes and a buy a new one if you want the new features. iPhone 4 and 3gs are already starting to struggle with iOS 5. Apple doesn't want users to suffer slow performance with new features.